A book for children. Lily and Niko Rabbit are at childcare when the weather changes and a thunderstorm strikes. One of the children’s parents is a meteorologist and he talks with the children about thunderstorms. They learn about severe weather events like thunderstorms and what conditions these events can bring, like lightning, hail, and winds. They also learn what to do to stay safe. Reading this book?is a great way for parents, childcare providers, and caregivers, to talk to toddlers and preschool children about thunderstorms in a non-scary way. Children can easily relate to these characters and their story gives children the tools and information they need to help stay safe should a thunderstorm happen. Buy this book on Amazon.com today! Heather Beal is a military veteran with 23 years of crisis management and operational planning experience that she draws upon daily in her battle to raise two well-prepared, happy, curious, and intelligent children. As a trained emergency manager and parent, she saw the need to provide age-appropriate disaster preparedness information to young children in a way that empowered rather than frightened them. 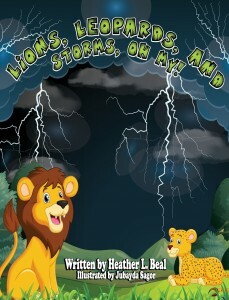 She is currently writing additional books to cover a greater spectrum of potential disasters children may face. This entry was posted in Education and tagged children, education, emergency preparedness, meteorology terms, prepare, preparedness, weather. Bookmark the permalink.